She dreams awake, for sleep won’t come. And weeps in silence, as though dumb. And to herself she daily lies. A cold affront to her dignity. Whene’er she writes her own last name. When you've chosen to keep your last name for the sake of your child, it is a bittersweet pill. There are good memories tied to that name. There is a child tied to that name. There is an entire set of in-laws tied to that name. (Which can be a good or bad thing). From my perspective, it seems to be a constant reminder of my ex-husband and the failure of the marriage--a very painful reminder. This is compounded by the fact that I actually was engaged to be remarried since the divorce, but I ended up breaking the engagement because I was just not ready. My fiance died this past October from a heart attack. The new marriage was just not meant to be. I have contemplated reverting back to my maiden name, but it seems like a lot of red tape and probably would add a lot of confusion to my business dealings. Plus, I consider how it might make my son feel alienated from me. If the last name is good enough for him, then it is good enough for me. It is just a name. The character behind the name is who a person ultimately is. This is what I strive to remember. The name "Regret" may cause some to pause. My regrets are many--not that I am actually divorced, because that cannot be undone; but that it had to actually come down to it. I regret that I have a failed marriage--what I view as a black mark on my record. Bitterness? Oh yes, there has been a boat load of bitterness. But it's getting better. Every time it pops up, I have to slap it in the head and tell it to sit down and shut up. Sometimes it wins. But those times are getting farther and farther between. Do I still cry when I write my last name? No. Those days are behind me. Do I still feel a twinge of sadness? Yes. But I trust as time goes on even that will fade. You never know what life will bring. In the words of Kermit, for now at least, I just smile and say, "I ain't easy bein' green." A lonely Wednesday night spells out the beginning of trouble in Paradise. Divorce from a Christian perspective--the aftermath of a difficult choice. Practical tips for keeping it together when your marriage has fallen apart. A personal blog of hope and inspiration. What does a single mother do when her world turns topsy turvy? She relies on her faith in God to give her hope and a new life. She writes! Even though it's a sad poem, it's a very lovely one. 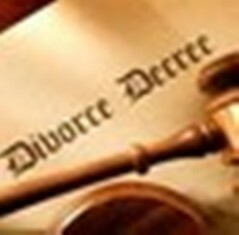 I am in the stage of contemplating divorce, and feel confused. Even now as I think about taking back my own name, our only child is an adult, and I'm unsure how he would feel. I'm unsure about how I feel, sometimes I'm angry we can't talk things out, and feel that many of the issues were caused by him. But we had many good times and good years, and I hate to throw that away too. Thanks for the poem. I'm glad you enjoyed my sad poem. Thanks for stopping by Anna. Thanks for stopping by. I try to be as real as I can. That must be really hard. I like the poem and commentary; it's just very real. Hello, everyone. I wrote the first two pieces at the age of 15. The third, about 20 years ago. They are, I suppose, technically, antique poems.